This post was contributed by guest blogger Didem Goz Ayturk, a Postdoctoral Fellow in Connie Cepko’s Lab at Harvard Medical School with edits from Addgenie Karen Guerin. Adeno-associated virus (AAV) has emerged as a favorite viral tool for both research and clinical applications. AAV can be used to transiently express a gene of interest in a variety of cell types. It was first described about 50 years ago as a contaminant of adenoviral preparations, hence the name (Atchison et al., 1965) AAV is a single stranded, DNA virus belonging to the family Parvoviridae. It has a "simple" genome packaged in an icosahedral capsid. It does not have a lipid coat, also called an envelope, and thus cannot support the addition of a glycoprotein, such as VSV-G, to its surface. In research applications, the genome is typically gutted so that precious cargo space is opened for gene delivery, and for safety. You can easily complement the virus in a tissue culture setting, in other words “in trans”, by supplying the genes that encode the replicase functions and capsid proteins. This gives researchers the ability to produce more virus in a controlled setting. Even though AAV is isolated from a wide range of organisms, it has not been associated with disease, and it is considered a biosafety level 1 (BSL1) viral agent. 1. Cargo capacity: Even the gutted version of rAAV has a cargo capacity of ~ 4.7 kb, which is one of the key limitations of the virus for gene delivery. However, if your gene(s) of interest is small enough, you can design single rAAV vectors with two genes packaged in them, and use elements such as IRES or 2A, to co-express them from one promoter. Co-infection rates for different rAAVs are also quite high if the titers are high, so if you cannot fit both your genes in one vector, you can coinfect (although this may not always work efficiently in vivo). 2. Specificity: There are a few different rAAV components that can drive gene expression in specific cells/tissues; these include the promoter, Flp or Cre dependent gene switches, and the serotype (serotype will be discussed more below). If you are aiming for broad expression, a broadly active promoter, such as CAG (chicken beta actin promoter with CMV immediate early enhancer), is a good choice. If you have a specific target cell type, you may want to try a different promoter, e.g. Camk2a for a neuron-specific one. rAAV vectors with Cre- or Flip-dependent gene expression, on the other hand, can be injected into animals with Cre or Flp expressed in specific cell types resulting in gene expression only in these cells. 3. Serotype: Capsid proteins are very important rAAV vector components and drive the biology of these vectors. Although multiple studies have shown that different serotypes differ in their ability to infect different cell types, a recent study showed that most (or all) serotypes use the same receptor (AAVR) (Pillay et al., 2016). The observed tropisms may be due to other factors, such as the attachment of the virions to the cell surface, or perhaps steps subsequent to entry, such as uncoating. AAV nomenclature can be confusing. You will likely see designations such as AAV2/2 or AAV2/8, but what do these numbers actually mean? The first number stands for the inverted terminal repeat (ITR) type. ITRs are short DNA sequences that flank the AAV genome and allow it to form concatemers in host cells. They, along with the Rep protein, facilitate integration into the human genome at the AAVS1 site on chromosome 19, something that is only observed with wild type AAV – not the vector forms. Almost all vectors contain type 2 ITRs . Type 2 ITRs can be packaged with a variety of capsid types. The type of capsid used to package an rAAV vector, i.e the serotype - is denoted by the second number. For example, if an rAAV vector has an ITR of type 2 and a capsid of type 8, it will be denoted AAV 2/8. 4. Genome: Wild type AAV are single-stranded DNA viruses. After uncoating of the DNA, the virus relies on the host cell replication machinery to synthesize the complementary DNA strand. This step is considered to be a limiting factor in the transduction efficiency of rAAV. To overcome this, (McCarty et al., 2001) engineered a dimeric, or self-complementary, AAV (termed an scAAV) by mutating one of the ITRs. scAAV vectors display rapid onset (days) and higher level transgene expression than ssAAV. However their packaging capacity (<2.5Kb) is half that of ssAAV (<4.8Kb), restricting the number of genes and regulatory elements that can successfully be packaged. scAAV may be valuable if you require rapid transgene expression. A lower titer may be able to achieve desired transgene expression levels, minimizing the chance of seeing toxicity or immunogenicity due to high virion concentrations. Quick side note: You can use retrograde AAVs to map neuronal connections. There are several facilities nation-wide where you can obtain excellent quality, high titer rAAV (including Addgene! ), but you can also generate rAAVs in your own lab with standard molecular biology tools and tissue culture experience. Briefly, you start by transfecting HEK293T cells with an rAAV vector carrying your gene of interest, an adenoviral helper plasmid, and a plasmid containing Rep and Cap (Figure 2, commonly referred to as “triple plasmid transfection”). After 2-3 days, you collect the supernatant, (or in some cases make a cell extract as some rAAV serotypes are released into the culture media while others are not) (Vandenberghe et al., 2010) from which you precipitate the virions using PEG. You then purify the virions further by density gradient centrifugation using a high-speed ultracentrifuge. The virions will form a band due to their high density, and you can collect this band from the gradient. You then remove the density gradient material by dialysis/buffer exchange and can further concentrate the virions if needed. 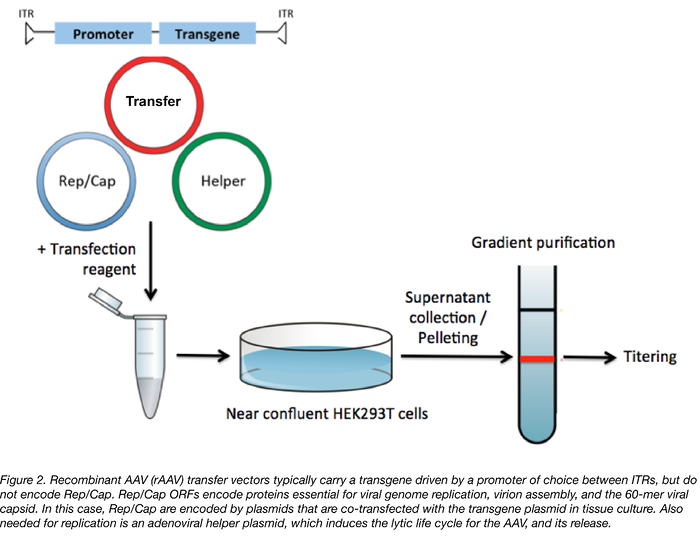 The virion prep can be titered by qPCR using primers targeting the viral genome, and/or protein gels (Veldwijk et al., 2002). These titers are for physical particles, many of which are not infectious. The ratio of physical particles to infectious particles can vary greatly, from 1 to >100. AAV virions are quite stable. They will withstand freeze-thaw cycles and dehydration, which makes contamination from previous preps that might be on your bench, in your centrifuge, or in your incubator, possible. To minimize this, you should treat all disposable items and surfaces that come into contact with the AAV with a disinfectant, such as Coverage Plus NPD. Also very important is to apply common cell culture practices diligently. Injection Titer: The number of viral particles you can deliver to the tissue will be determined by the titer of your viral prep and the maximum volume that can be delivered, and is of great importance. Unfortunately, as mentioned above, the titer of the physical particles cannot be directly translated to what you will observe in vivo, although it is a starting point. You can start by scouring the literature for advice on particular tissues, but, often, the optimal dose will need to be determined empirically in vivo by trying a series of dilutions. Visualization of the Infection: You should also think about how you will visualize your rAAV infection before you start the delivery process. Have you included a reporter gene in your rAAV construct, such as GFP or mCherry? These will make it easy to directly observe where expression is occurring via fluorescence measurements. If not, you can consider co-injecting an AAV that carries a reporter gene under the same promoter driving your gene of interest and measuring reporter gene expression as a proxy for your gene of interest, which may not be easy to detect. If co-expression or co-infection are just not possible, detecting your protein by immunohistochemistry or in-situ hybridization might be your best bet. Time after infection: An adequate amount of time needs to pass between injection and tissue processing to detect AAV-mediated gene expression. Timing will highly depend on the capsid type and on the tissue you're infecting. Waiting ~2 weeks is a good starting point for many tissues. AAV-mediated gene expression has been reported to be quite stable, lasting for several years in human clinical trials and in dogs (Wonjo et al., 2013). AAV is an extremely versatile tool for viral gene delivery. The demands of your particular research application will determine the appropriate parameters of AAV design and delivery. Although your final serotype/titer/age determination will heavily rely on pilot experiments, you can look to the ever-growing literature for design recommendations appropriate to many different biological systems. With more than a hundred clinical trials involving AAV started in the last two decades, it seems that this tool will remain popular in both therapeutic and basic research settings in the years to come. Many thanks to our Guest Blogger, Didem Goz Ayturk! Didem Goz Ayturk is a Postdoctoral Fellow in Connie Cepko’s Lab investigating neuronal circuits of the retina using viral tools. 1. Atchison, Robert W., Bruce C. Casto, and William McD Hammon. "Adenovirus-associated defective virus particles." Science 149.3685 (1965): 754-755. PubMed PMID: 14325163. 2. Pillay, S., et al. "An essential receptor for adeno-associated virus infection. "Nature 4:520(7588):108-12 (2016). PubMed PMID: 26814968. 3. McCarty, D. M., Paul E. Monahan, and Richard J. Samulski. "Self-complementary recombinant adeno-associated virus (scAAV) vectors promote efficient transduction independently of DNA synthesis." Gene therapy 8.16 (2001). PubMed PMID: 11509958. 4. Vandenberghe, Luk H., et al. "Efficient serotype-dependent release of functional vector into the culture medium during adeno-associated virus manufacturing." Human gene therapy 21.10 (2010): 1251-1257. PubMed PMID: 20649475. PubMed Central PMCID: PMC2957237. 5. Veldwijk, Marlon R., et al. "Development and optimization of a real-time quantitative PCR-based method for the titration of AAV-2 vector stocks. "Molecular Therapy 6.2 (2002): 272. PubMed PMID: 12349826. 6. Xiong, Wenjun, and Constance Cepko. "Distinct expression patterns of AAV8 vectors with broadly active promoters from subretinal injections of neonatal mouse eyes at two different ages." Retinal Degenerative Diseases. Springer International Publishing, 2016. 501-507. PubMed PMID: 26427452. 7. Okada, Takashi. 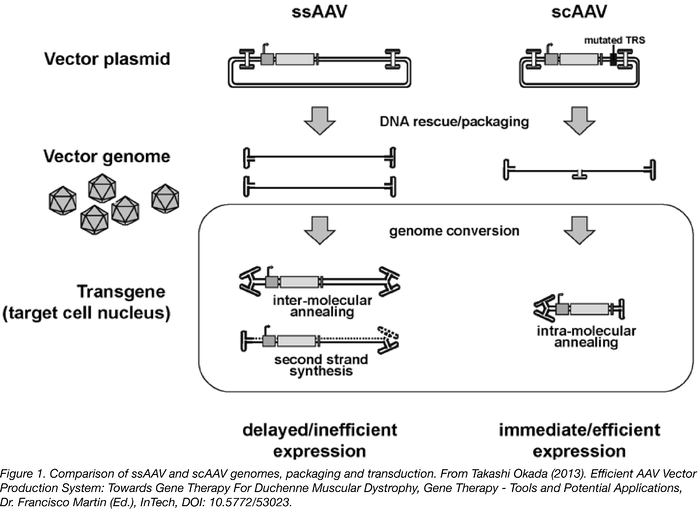 Efficient AAV Vector Production System: Towards Gene Therapy For Duchenne Muscular Dystrophy. INTECH Open Access Publisher, 2013. Intech Webpage. 8. Wojno, Adam P., Eric A. Pierce, and Jean Bennett. "Seeing the light. "Science translational medicine 5.175 (2013): 175fs8-175fs8. PubMed PMID: 23467559.